Recently went to my local library to renew my library card. I went to a different branch than where I originally signed up. My daughter and I were walking around afterwards to see what they had on their shelves. Having come back from my Japan trip last October/November, I felt drawn to the travel section. How could I resist seeing what they had for my next grand adventure. I found this book among the shelves and had to recommend it. While not a true cookbook, it fell into travel section. It has wonderful pages of photos, recipes, places to see and what I should try while there. It gives names of resturaunts, special events, festivals and markets to visit. It covers a plethora of cuisine in exotic places and regional faire. I am already making a list of some of these places to see in the future. It’s almost a bucket list book for every food lover out there. I have to admit I am excited to try out some of the recipes in the book as well. 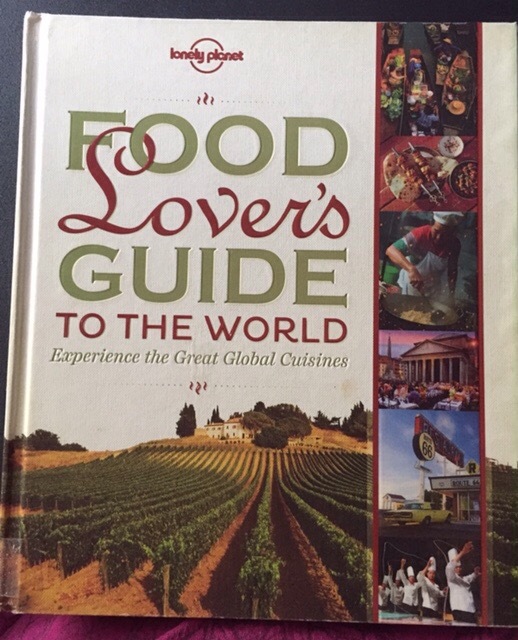 So check out “Foodlover’s Guide to the World” it’s a Lonely Planet book. Such an awesome book, I have a copy at home 🙂 It’s got nice recipes, but you’re right – it’s a lovely travel book and it’s also just a great read!